The end of the War of 1812-1814 brought changes in the lives of many of its veterans. Captain George Lyon of the 99th/100th Regiment decided not to return to his native Scotland. Instead, in 1818, he came to the Richmond Settlement in the wilds of Upper Canada. Meanwhile, two militia officers, Joseph Shuter and Robert Charles Wilkins, both from respected Canadian families, became partners in the Montreal “China” trade. During the 1820’s Shuter and Wilkins were the exclusive suppliers of various types of ceramic dishes and glassware to the store established by Lyon. As noted in previous blogs, George Lyon’s store stocked a full range of products. Although the largest part of the inventory purchased from Montreal merchants involved various types of fabrics, it also included some tableware. Some of the tableware were metal and some were crockery. Elizabeth Collard in “Nineteenth Century Pottery and Porcelain in Canada” outlines how lower class immigrants were counseled to bring “wooden noggins and trenchers, and tin porringers” because crockery was so fragile. As many of the Richmond settlers were the families of disbanded soldiers who had spent years moving around Upper & Lower Canada, it is probable that much of their tableware fell into this category. The Lyon’s store stocked tin products such as mugs to meet their needs. Collard tells us that even the upper classes were discouraged from bringing crockery with them. It appears that the settlers with financial resources (half-pay officers, government officials, ‘gentlemen”, and other merchants) turned to George Lyon’s store for earthenware and/or porcelain dishes to enhance their tables (after settling into their new homes). Shuter & Wilkins of Montreal became the supplier of crockery for the Lyon’s store. Collard says that Shuter & Wilkins “carried on one of the largest and most successful China-selling ventures in the colonies”. Their stock was imported from various Staffordshire factories, carried by sailing ships to Quebec City or Montreal, and repacked for the Upper Canadian market. During winter months, goods could be moved by sledge but in summer the transportation route along the Ottawa River required a combination of boats, wagons and at times panniers on horses. 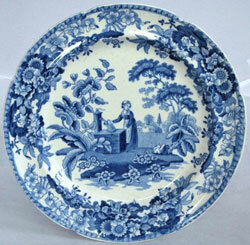 Collard tells us that in the 1820’s, the most common form of fine tableware in Upper Canada was Earthenware. Made from natural clay, it was an opaque, lead-glazed pottery, which varied in colour from deep to pale cream (called creamware). Originally any decoration was hand-painted on the glaze. Early in the nineteenth century, printed earthenware became popular. It was whiter than creamware and was decorated by transferring a printed design from paper to the earthenware before glaze was applied over the design. In Richmond, buyers seem to have preferred blue for these printed designs but both painted and printed earthenware were popular in the 1820’s. Porcelain, fired at high temperatures, was made from a combination of clay, stone, and bone ash. 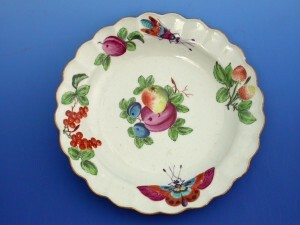 Porcelain was never brought to Upper Canada in the same quantities as earthenware. The more translucent quality of this type of ceramic made it popular with wealthy Montreal hostesses but it was more expensive than earthenware. Shuter and Wilkins began calling themselves “China” dealers in 1819 as they included among their imports the more expensive porcelains such as “Bone China”, and wanted to distinguish their store from the stores of other merchants. It is difficult to definitively pinpoint what the store clerk meant by these four references. The letters C.C. was most likely the notation for “common crockery”, the most prevalent type of basic earthenware found in Upper Canadian stores of the time. In his first order, Lyon imported 9 dozen “flat and soup plates”, 12 dozen oval bowls as well as many other items of this type (including non tableware: 1 dozen wash basins and ½ dozen chamber pots). The “blue and green edged” crockery was slightly more expensive and restricted to a much smaller range of items, mostly flat & soup bowls (9 dozen) and dishes (12 dozen), baking dishes and sauce bowls. Although “edged” items appeared on later invoices, none were of any specified colour. The “enameled” crockery probably referred to enamel items with hand “painted” designs. In this order the items were mainly restricted to what one might find in a dessert set – cups and saucers (18 doz. ), tea plates (¾ doz. ), sugar boxes (¾ doz. ), milk pots (1 doz.) & pitchers (16), bowls (9 doz. ), and mugs (3 doz.). Of interest was the addition of ½ dozen “peppers & mustards” and 1 dozen “salts”. Most orders included “painted” items. The fourth type of dishes was “ blue printed” and the order consisted of mainly bowls and sauces (4 doz.). In later orders this notation was often shortened to “blue” and the blue printed dishes became a favourite among customers. The value of the total order was L29/6/2. On March 2nd 1822, George Lyon received a second order from Shuter & Wilkins valued at L32/17/6. (Edwin Welch’s transcription can be found in figure 2) This order included roughly the same number of C.C. items but fewer “painted” items (½ as many cups & saucers). Instead he ordered more “blue printed” cups & saucers, bowls, and teapots. 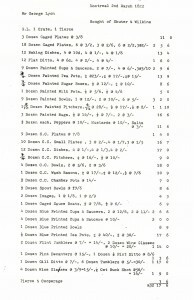 This order included a new type of item – “gaged” plates, dishes and sauceboats. (Welch says these were “probably jet black” items but I found no confirmation). These gaged items did not appear on later invoices. For the first time, glassware – tumblers (8 doz. ), wine glasses (6 doz. ), decanters (3 doz. ), as well as, two dozen images (mirrors? pictures? figurines?) – were included in the order. Although Shuter & Wilkins specialized in crockery & porcelain items, they still had other products in their store. Thus one sees the entry of ¼ cwt. of buckshot in this order, as well as, 3 dozen “Egyptian inks”, and three 3-point “Whitney” blankets on a later invoice. (“Whitney” blankets probably refers to “Witney” blankets which were usually sold in the Canadas by the Hudson Bay Company). 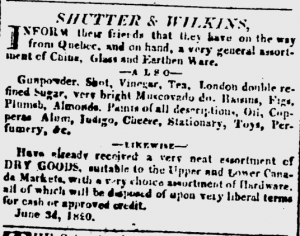 In fact the advertisement from the Montreal Herald of June 10, 1820 shows the range of items made available to customers. Shuter & Wilkins filled 10 more orders for the Lyon Store between July 1822 and August 1829. None of these was as large as the initial orders and most seemed to be “refilling the shelves”. There were, however, changes in the orders, which seem to reflect the maturing of the community. Some new special items appeared on the invoices: black tin tea pots, a brown lined covered dish, a small ‘China’ pitcher, ½ doz. fire proof dishes, two dozen fruit tumblers, 2 pair of cut decanters (1 pair was cut Quartz), and a ‘China’ punch bowl are examples. Orders were still predominately composed of common crockery, painted, printed and edged plates, dishes, and cups. From all this, one can conclude that if one was a member of the wealthier “gentry” in the Richmond Settlement one had access to and purchased a variety of earthenware dishes and a small amount of ‘China’ from the Montreal merchants. Richmond hostesses could indeed set a fine table. 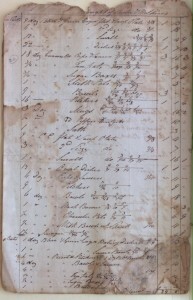 Account Book of George Lyon’s Store. City of Ottawa Archives. Collard, Elizabeth. Nineteenth Century Pottery & Porcelain in Canada. 2nd Ed. Kingston & Montreal: McGill-Queen’s University Press, 1984. Welch, Edwin. “A Pioneer Store in Upper Canada” Ottawa:1982. Unpublished manuscript written for The Historical Society of Ottawa. City of Ottawa Archives. This entry was posted in merchandise and tagged commercial, Lyon, store. Bookmark the permalink. Back from the dead! Nice post! Excellent research and writing, Marion. This gives a real description of one aspect of life in this part of Upper Canada, and also of the trade and merchandise methods and routes being used. Now that the season is changing I hope you will be able to produce more papers of this quality. I appreciate this research concerning my ancestor the Honorable Colonel Robert Charles Wilkins partner of Joseph Shuter in this importing business also serving Upper Canada in his store of the Bay of Quinte at Carrying Place. Col Wilkins was the father of Sarah Elizabeth Wilkins wife of Peter McGill of Montreal and was also legislative councillor of Upper Canada 1838-1840.